Age, 51, of Lynnwood, Washington State, died on July 28, 1996. She was native of Minnesota and lived with her family in Seattle. She attended Duluth, Minnesota School from 1948 to 1952. Then, she attended at Summit School in Seattle. Transferred to Washington School for the Deaf (WSD), Vancouver, Washington till graduated in 1965. During WSD years, she involved the activities: bowling team, volleyball team, pep squad, and Student Council. 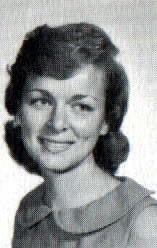 She went to Gallaudet College for one year - 1965 to 1966. She had two daughters, Cora Borgens and Reba Norris; two granddaughters, and her brother, Bob Redding. She worked for the rights of the deaf for many years till her death. She was buried at Bonney-Watson in SeaTac, Washington State. Click "Return back to Gally '70 webpage"